The Greener Government Building (GGB) Program was administered by the State Department of Treasury and Finance which aims to reduce Government's environmental impact while achieving operational savings. 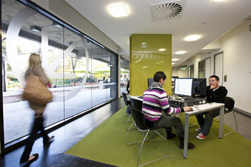 La Trobe University is committed to achieving financially and environmentally sustainable outcomes, in particular reducing facility energy consumption and carbon emissions. In 2011, the University began participating in the State Government Department of Treasury and Finance's Greener Government Buildings (GGB) program. The program provided 0% interest funding to identify and implement energy and water consumption reduction projects with a seven year payback (paid for through the operational savings realised by the projects). The program was aimed at tertiary education facilities and included a learning and research component. The total cost of the Program was estimated at $30M. In 2012, a change in State Government saw a change to the Program, removing the 0% interest funding availability from Universities, however continued to funding for TAFEs. Despite the change in the funding model, the University chose to continue with the program, engaging Siemens to conduct a Detailed Facilities Study (a high level energy and water audit) on the Melbourne, Bendigo and Albury-Wodonga campuses. In addition to this work, Expressions of Interest for learning and research projects were called for and three projects were identified to be funded through the Program. With the University undergoing significant changes to achieve the Funding Future Ready objectives, the University is unable to fund the up-front capital required to move to the next stage of the GGB Program. La Trobe withdrew from the program in 2013. The outcomes of the Detailed Facilities Study will be used to identify and implement energy consumption reduction projects delivered by Infrastructure & Operations Group. These works will contribute toward the University's sustainability targets to reduce facility energy consumption and carbon emissions. The learning and research documentation from the Program has been provided to the University's Research Services area for future funding bid consideration under the appropriate Research Focus Areas. We appreciate the contributions and commitments of all University staff who were involved with this Program from 2011 - 2013. The I&O Group will provide updates on implemented works as they occur.